Cladding on a tower block in Bristol, which is of a similar nature to Grenfell Tower in London, is to be replaced. In August, Avon Fire and Rescue Service confirmed the privately-owned Eclipse Tower in Cabot Circus used aluminium composite material. 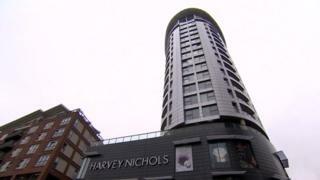 A spokesman for Hammerson, on behalf of its landlords, said the work would take place "as early as next summer". He said residents had been notified of the landlord's decision. "This is subject to securing the necessary statutory consents and the relevant building control approvals," he added. "We have been working with the relevant authorities, including Avon Fire and Rescue Service, who have inspected the common parts of the building on a number of occasions and confirmed that fire safety provision is compliant under the Regulatory Reform Fire Safety Order." The issue came to light following a Freedom of Information request by the BBC to the fire service. The cladding is also understood to have a polyethylene (PE) core, the same combination as at Grenfell Tower where 71 people died in the 14 June disaster. Extra patrols have been introduced at the Eclipse Tower as a precaution and residents have been told not to have barbecues on balconies. Where have cladding fire tests failed?